Buy D'Cold Cough Syrup - Effective Remedy For Nasal Congestion (Blocked Nose), Sore Throat Pain & Fever, Runny Nose & (Sneezing ) Headache, Body Aches & Pains. 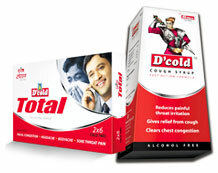 D’Cold takes great pride in providing its consumers with effective cold and cough remedy at an affordable price. In a market where competition is rampant, in a short span of 10 years D'Cold has become synonymous with cold and cough relief. D'Cold understands the dynamics of its customer base and it is that understanding that helped it carve a niche for itself. D'Cold Cough Syrup, an alcohol free non-drowsy formula, is targeted at children and adults. It is the safest medicine for cold and cough for children and reduces painful throat irritation, gives fast relief from cough and clears chest congestion. It relieves the tension of every mother when her child gets ill. It contains a fast action formula which is brought to life by the 'Khansi ka fighter - DC Man', who fights 'Khansiwale monsters' curing cough and cold effectively. New D'Cold Total Tablets, are targeted to adults and helps in curing 4 symptoms associated with cold .Its Non Drowsy Formulae makes it friendly for all active adults, because work is not interrupted. Adult : One tablets 4 times a day times a day. Children : Consult a doctor, do not exceed 2 tablets a day ( in divided dosage ). Not for children under 6 years. Do not use with other Paracetamol products. In case of overdose consult Doctor immediately. Keep out of reach of children. Today, millions of customers trust D'Cold to provide effective and holistic relief for the most common ailments. Because cold germs on your hands can easily enter through your eyes and nose, keep your hands away from those areas of your body . Avoid close contact with people who have a cold, especially during the first few days their symptoms appear. This is when they are more likely to spread their germs. Frequently disinfect surfaces in your home and office-especially things like phones and doorknobs that many people touch. Take a hot shower. Make it a long one and breathe in the steam. It will help to moisturize your throat. Raise your head, especially while sleeping. Drink more liquids. They will also help to break up any mucous in your system making your cough more productive. Use a vaporizer while sleeping. Drink tea . It will help help open your airways and moisturize your throat. Stop smoking and stay away from other smokers. The smoke will dry your throat more causing you to cough more.